This is one of my favorite things to prepare for a crowd. You just purchase the ingredients, put them on a platter and serve. What could be more easier? When I serve this all you hear are the ooohhhs and aaaaaahhhs. They seem to think I have spent hours at it. I have written about my favorite deli before. We visit it once a week on Thursday, now known as super sausage Thursday. We all pile into the car and away we go. It now doesn’t matter who is at our house, away we go. Even our grandchildren know the routine and when they come with us they make sure we don’t forget our basket at the door to place our purchases in. Purchases which they help to choose. It’s quite amusing, when our youngest grandson is with us he gets the basket and carries it himself. I get my little packages of meat, he’ll take them and put them into basket but not normally. He places the basket on the floor, stands back and aims them like he was playing basketball. Throws them in and looks at us like he just won a championship game. It’s great fun and hopefully things that they will all remember. This deli is small but awesome. Making their own meats, people come from miles around to make their purchases. I become a different person when I enter that door. I’m like a child in a toy store. I could purchase some of everything. Walking out of there you think I was feeding half of the city I live in. Try making this recipe with your own spin. Use the cold cuts that you like and combine them with veggies and buns and other things. It’s always great fun to see what the end result is. On a serving platter, arrange all of your cold cuts, pickles, olives, cheese, radishes, peppers, different cheeses and anything you like. Don’t forget the buns and or bread. 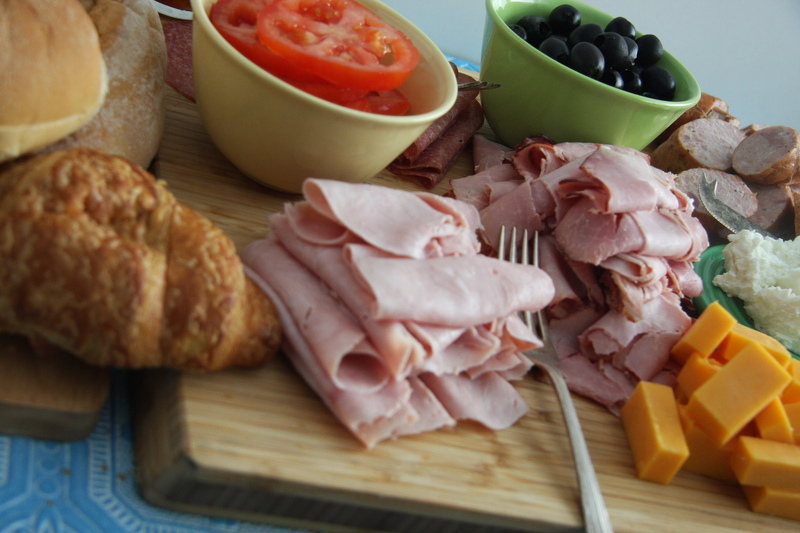 Arrange cold cuts on a platter with cutlery. Place buns along side or bread. Whatever you crave, just throw it together. Make it uncomplicated and easy and you can also use what you have on hand. Slice buns in half. 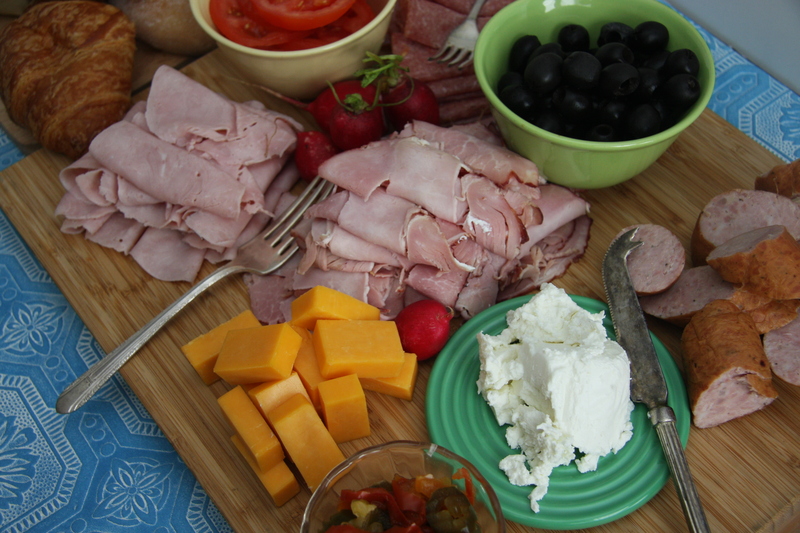 Place cold cuts, pickles and rest of the ingredients onto a tray, arranging nicely. Cover and refrigerate if you do not use right away.